Making decisions without clear insight is just guessing. Analytics reporting software provide easy access to intelligent information that helps you answer strategic questions, build better processes, and make decisions that drive real improvements. Display the data you need, when and where you need it. Slice data by attribute for customized content. Personalize content, including favorites and recently used visualizations. View related content by persona or domain. Access your data when you need it via Web, tablet, or mobile device. Boosts efficiency, accuracy, and consistency with a central data portal. 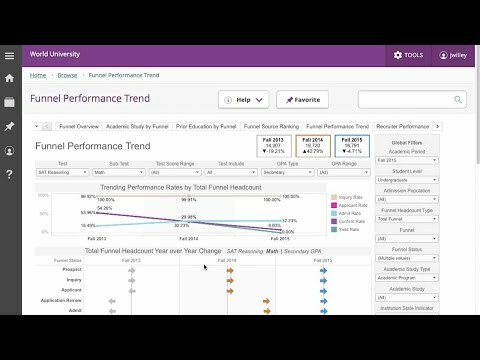 Access financial, HR, and student data from a central point. Standardize definitions and metrics across departments. Deliver consistent messaging based on reliable, real-time data. Enable a broader, deeper understanding of institutional performance. Increase accountability and transparency. Track key performance indicators. Create and publish trend analyses with ease. Articulate strategy and goals with confidence, using data-supported evidence. Share essential, timely data with key stakeholders and employees. Help you make smarter decisions and deliver better services—faster. Decipher data quickly with interactive dashboards and tools. Eliminate time-intensive data collection and administration. Reduce cost and inefficiencies associated with outdated, disparate legacy systems. Integrate with Ellucian solutions already in place. Manage your dynamic environment with critical information that supports all Banner workflows. Enable longitudinal comparisons and trend analysis across multiple dimensions. Respond quickly to state and federal government reporting requirements. Reduce implementation and support costs with inherent integration. Improve Banner performance by off-loading analytic queries. Manage data for key processes in admissions, financial aid, advancement, and accounts receivable. Provide a scalable business intelligence platform across your institution. Span all systems and departments to provide a comprehensive view of institutional performance. Enable operational reporting, time series, and longitudinal analysis with pre-built business intelligence applications. Reduce IT development, support, and maintenance costs with higher education content. Deliver out-of-the-box metrics for finance, human resources, student, and constituent relaionship management (CRM). Integrate easily with Banner, student information systems, portals, and CRM systems. See historical and summarized information. Ensure consistent data for operational reports and ad hoc analysis. To current, secure, and consistent information boosts effectiveness. Delivers information organized into easy-to-understand, business concepts. Requires no prior knowledge of SQL or Banner table structures to use. Enables sharing and collaboration across the institution using a common environment. Features packaged higher education analytics and best practices. Deliver business intelligence administrative controls and processes to ease burden on IT department. Schedule, execute, and monitor data loads. Schedule date-stamped, event-based data snapshots. Define data cleansing rules. Maintain meta data source, target, and business views. Define security rules for database access control. Provides simple drag-and-drop functionality to build, customize, and modify reports. Create ad hoc reports with pre-built templates. Build customized analytic applications without IT support. Apply packaged, higher education analytics based on industry best practices. Reduce implementation and support costs by integrating with Colleague® by Ellucian.